"Happy he who has passed his whole life mid his own fields, he of whose birth and old age the same house is witness....For him the recurring seasons, not the consuls, mark the year; he knows autumn by his fruits and spring by her flowers." Attributed to Romulus himself, the Roman calendar originally was determined by the cycles of the moon and the seasons of the agricultural year. Beginning in March in the spring and ending in December with the autumn planting, the year then was ten months long and had six months of thirty days and four of thirty-one, for a total of 304 days (ten lunar months actually comprise about 295 days). Since each month began and ended with the new moon, that day would have belonged both to the new month and the old and must have been counted twice. The remnants of this early calendar still can be recognized in the numbered names for Quinctilis (July), Sextilis (August), September, October, November, and December. The two months of winter, when there was no work in the fields, were not counted; Cato, for example, speaks of payment for olives being due in ten months (De Agricultura, CXLVI). But the moon's lunation, a period of approximately 29.5 days, is not the same length of time as the earth's annual orbit around the sun, a period of approximately 365.25 days. Twelve lunar months are shorter by about eleven days than the solar year (365 - 354). Without intercalating (inserting) these missing days, the calendar cannot maintain synchronicity with the seasons. Such was the disparity between the calendar of the Roman Republic and the solar year that, when a nearly total eclipse of the sun was observed in Rome on March 14 (190 BC), it was recorded as having taken place on July 11, the fifth day before the Ides of July. (Indeed, just the year before, the lex Acilia had sought to regulate intercalation.) An eclipse on June 21 (168 BC) in northern Greece was recorded as having occurred on September 3, the third day before the Nones of September (Livy, XXXVII.4; XLIV.37). Nor did the college of pontiffs (from pontifex or "bridge maker"), who were responsible for regulating the calendar and the festivals that depended upon it, always intercalate the additional days necessary to synchronize the lunar and solar year. Intercalation was considered unlucky and, during the Second Punic War (218-201 BC), when Rome struggled against Carthage, the priests were hesitant to make any changes at all. Often, too, the calendar was manipulated more for partisan political consideration and vested interest than to adjust for the seasons. The tenure of an office holder could be extended or reduced, and legislation given more or less time before a vote. Bibulus, Caesar's co-consul in 59 BC, for example, attempted to thwart the legislation of his more powerful colleague by declaring all the remaining days of the year to be holidays so the assembly could not legally meet (Dio, XXXVIII.6.1). Indeed, in 153 BC the new year was moved from the Ides of March to the Kalends of January (January 1) so that newly elected consuls could assume office. That year, a reformed calendar based on the solar year was introduced by Caesar, who first had heard about it, relates Lucan (Pharsalia, X.187), while consorting with Cleopatra. With the advice of the Alexandrian astronomer Sosigenes, the missing ninety days were intercalated, extending this ultimus annus confusionis ("the last year of confusion," Macrobius, Saturnalia, I.14.3) to 445 days. The twenty-seven days of the intercalary month were added after February 24 and its last four days suppressed, and two more intercalary months, totaling another thirty-three and thirty-four days, interposed between November and December (355 + 27 - 4 + 33 + 34 = 445). To correct for the days that were lost in the old lunar calendar of the Republic, one or two additional days were added at the end of those months with twenty-nine days. January, Sextilis, and December now had thirty-one days, and April, June, September, and November, thirty days. The resulting calendar of approximately 365 days had four nearly equal seasons—January (31 days), February (28), and March (31) comprising a winter of 90 days (91 during a leap year); April (30), May (31), and June (30), a spring of 91 days; July (31), August (31), and September (30), a summer of 92 days; and October (31), November (30), and December (31) an autumn of 92 days. The winter solstice (Bruma) was determined to be December 25 (VIII Kal. Jan.) and, in conformity with this date, the vernal equinox, March 25 (VIII Kal. Apr. ); the summer solstice, June 24 (VIII Kal. Jul. ); and the autumnal equinox, September 24 (VIII Kal. Oct.). This, then, was the new Julian calendar, which was introduced on January 1, 45 BC (the first new moon after Bruma). Because the solar year is approximately a quarter day longer than the calendar year, a single intercalary day also was to be inserted every four years, when February 24 would be counted twice. This was a bissextile or leap year, since that date was the "twice sixth" day, bissextus, before the Kalends of March. (The notion of February 29 is a modern construct.) When Caesar was assassinated in 44 BC, Quinctilis, the month in which he had been born, was renamed Julius (July) in his honor, although this change in the name of the month was ignored until made legal after the appearance of a comet four months later during games sponsored in July by Octavian, which, recounts Cassius Dio, was understood to be a sign of Caesar's apotheosis. Octavian is thought to have moved these games to late July to overshadow games sponsored by Brutus earlier that month. Hearing of their announcement, Cicero responded in a letter to Atticus, "Good heavens! 'Nones of July'! Confound their impudence!...Could anything be more unseemly than 'July' for Brutus?" Cicero also joked in a letter just four days after the new calendar had been introduced that the constellation of Lyre was rising "by Caesar's decree." But the pontiffs mistakenly adjusted for leap year every three years (having counted inclusively) and inserted too many intercalary days. In 8 BC, Augustus was obliged to omit any further intercalations until AD 8. Only then, after the superfluous days had been corrected and intercalation was resumed, did the Julian calendar function as intended, with February gaining an extra day every four years. In honor of his reform, Sextilis was renamed Augustus. It was that month, says Macrobius (I.12), that Augustus first had been elected consul, Egypt had become part of the Roman empire, and the civil wars ended. August also was the eighth month and appropriate for someone who earlier had been named Octavian. To correct for this retrogression and bring the calendar year back to the solar year, Pope Gregory XIII omitted these extra days, ordaining in 1582 that, for that year, October 4 was to be followed by October 15. And, to prevent the discrepancy in the Julian calendar from reoccurring, three leap years were to be omitted every four centuries. A leap day would not be added in those years that ended in hundreds unless they were divisible by 400; thus, for the first time since 1600, there was a February 29 in the centurial year 2000. The Gregorian calendar has been in use ever since, although, in practice, Republican dates tend to be adhered to before the Caesarian reform and Julian dates prior to the Gregorian reform. As Smith confesses in A Dictionary of Greek and Roman Antiquities, "It is extremely difficult, or rather quite impossible, to determine the actual dates which correspond to the nominal dates of any events before the Julian reform of the calendar, especially after the irregularities introduced by the lex Acilia." Dates from the time of the Republic, therefore, should be regarded as conventional expressions and not precise moments in time. 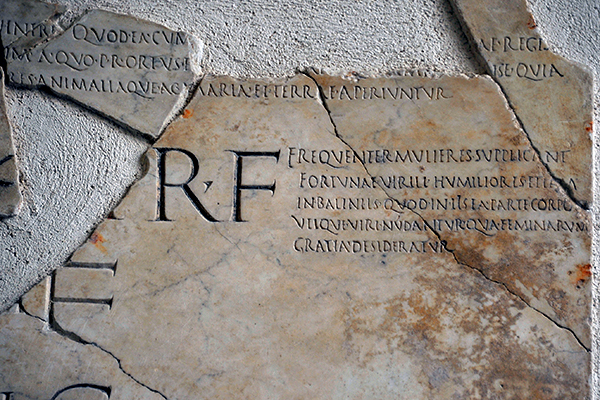 The Latin text, which is incised on a marble fragment from the Fasti Praenestini, reads "On April 1, women pray to Fortuna Virile, that they may hide the imperfections of their bodies to their own men." Ovid relates that women should bathe beneath the myrtle in commemoration of Venus, who once had screened her body with myrtle from the licentious gaze of satyrs. So, too, should women offer incense to Fortuna Virilis ("Man's Fortune") so that any blemish on their own naked bodies will be hidden from men (Fasti, IV.144; also John Lydus, De Mensibus, IV.65). England, Wales, and Ireland (and the British colonies) did not adopt the Gregorian calendar used on the Continent until 1752, in response to legislation introduced by Lord Chesterfield. Previously, the new year had begun on March 25 (the date the Romans counted as the vernal equinox) and, by then, was eleven days behind the Gregorian calendar, a discrepancy that was corrected by beginning the year on January 1 and having Wednesday, September 2 be followed by Thursday, September 14. References: The Oxford Companion to the Year (1999) by Bonnie J. Blackburn and Leofranc Holford-Stevens; Marking Time: The Epic Quest to Invent the Perfect Calendar (2000) by Duncan Steel; The Roman Festival Calendar of Numa Pompilius (1986) by Michael York; Festivals and Ceremonies of the Roman Republic (1981) by H. H. Scullard; The Roman Festivals of the Period of the Republic (1899) by W. Warde Fowler; Calendar of the Roman Republic (1967) by Agnes Kirsopp Michels; Chronology of the Ancient World (1980) by E. J. Bickerman; On Roman Time: The Codex-Calendar of 354 and the Rhythms of Urban Life in Late Antiquity (1990) by Michele Renee Salzman; Ovid and the Fasti: An Historical Study (1994) by Geraldine Herbert-Brown; Mapping Time: The Calendar and Its History (1998) by E. G. Richards; Calendar: Humanity's Epic Struggle to Determine a True and Accurate Year (1998) by David Ewing Duncan; A Dictionary of Greek and Roman Antiquities (1875) edited by William Smith; The History & Practice of Ancient Astronomy (1998) by James Evans; Time in History: Views of Time from Prehistory to the Present Day (1988) by G. J. Whitrow; The Oxford Classical Dictionary (1970) edited by N. G. L. Hammond and H. H. Scullard; A New Topographical Dictionary of Ancient Rome (1992) by L. Richardson, Jr.; Caesar's Calendar: Ancient Time and the Beginnings of History (2007) by Denis Feeney. Livy: The Early History of Rome (1971) translated by Aubrey de Sélincourt (Penguin Classics); Plutarch: Parallel Lives (1916) translated by Bernadotte Perrin (Loeb Classical Library); Ovid: Fasti (1936) translated by James G. Frazer (Loeb Classical Library); Suetonius: The Twelve Caesars (1957) translated by Robert Graves (Penguin Classics); Macrobius: The Saturnalia (1969) translated by Percival Vaughan Davies; Dio's Roman History (1916) translated by Earnest Cary (Loeb Classical Library); Petronius: The Satyricon and the Fragments (1965) translated by John Sullivan; Claudian (1922) translated by M. Platnauer (Loeb Classical Library); Statius: Silvae, Thebaid (1928) translated by J. H. Mozley (Loeb Classical Library); Pliny the Younger: Letters and Panegyricus (1969) translated by Betty Radice (Loeb Classical Library); Censorinus: De Die Natale (1900) translated by William Maude; Cicero: Letters to Atticus (1999) translated by D. R. Shackleton Bailey (Loeb Classical Library); Varro: On the Latin Language (1938) translated by Roland G. Kent (Loeb Classical Library).